Although of the same material as that commonly used by the Master of the Rocks school, the style of carving and the rather glittery polish here are quite different. The skin has been used with great imagination by the carver. 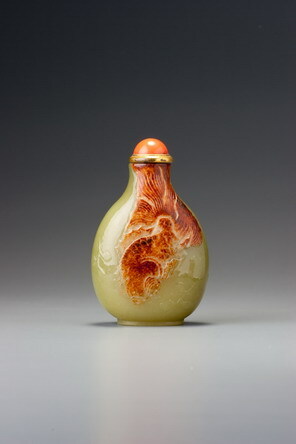 The formal qualities of the bottle are exceptional: an elegant, compressed pear-shape, flaring slightly at the neck, very crisply carved foot, and perfect formal integrity. It is also very well hollowed.